It only took one bite to realize this wasn't a drumstick ...but that was my fault really. I psyched myself up a bit too much as I walked to the check out line. Overall, I'd say they aren't bad. They grow on you as you go, but drumsticks are definitely better. Both do vanilla ice cream, though the drumstick vanilla is better. 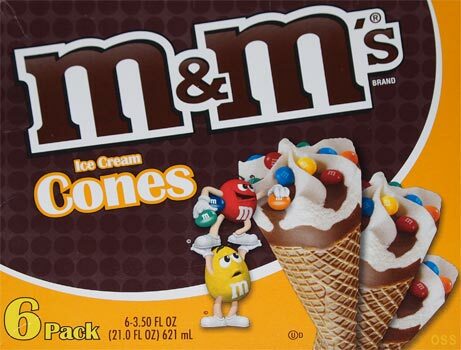 Instead of nuts, we have mini M&Ms on top and throughout the ice cream. They're decent, and I'm glad they went that extra step to actually put them in the ice cream. Then we have the fudge which is ok ...well, ok-ish really, not a huge fan. 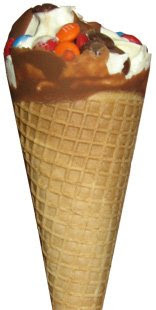 There's a bit of chocolate on the inside of the cone, but not nearly as much as you would find on a drumstick. Also, the cone had some soft spots which I always having trouble getting over. The whole point of the cone is to add crunch, so what's the point if it doesn't add crunch? Then we have the final bite, which is suppose to have a chocolate nugget in the bottom. It actually tasted a bit funny at first, didn't really notice the chocolate ...but then it left this lingering cookie-like flavor in my mouth. On Second Scoop: Ok, these continue to grow on me, but there is definitely room for improvement. First, I want to clarify my soft comment yesterday. With the weight watchers, I would hit gummy spots, but here, it's more of a soft spot, and it's not bad, it's just not the perfect crunch. Second, I want to point out the M&Ms again. This cone had a healthy smattering of M&Ms. Yesterday, there seemed to be less, but I just may not have been paying enough attention. Lastly, I still don't like the fudge because it just doesn't add much. In fact, I wish it wasn't there, I think it hurts (mild cheap aftertaste) more than it helps (cover up the mildness of the ice cream).